A group exhibition with participating artists: Ruth van Beek, Tim Bruening, Uwe Jens Bermeitinger, Daniel Feistenauer, Anne Charlotte Finel, Robin Hinsch, Henning Kles, Eike König, Magda Krawcewicz, Filipe Lippe, Stefan Marx, Roman Moriceau, Nøne Futbol Club, Michael Satter, Jakob Sinn & WeAreVisual. 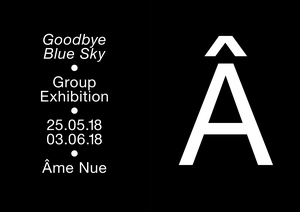 « Goodbye Blue Sky », Âme Nue’s first curated group exhibition, is a contemplative series of daydreams and escapes, a carefully composed narrative of shifting romances. It is the writing of ‘realities’ expressed for consideration, a succession of thoughts and images by artists who inspired us. While constantly watching the world unfolding its realism before our eyes, we maintain distant to questions of existence or integrity. Neither necessarily logical nor distant from the tangible world, this exhibition pictures the quietude of an eluded truth, merely worlds and societies, gone with the streams of phantasmagorias, vices and follies. Reflecting today’s mind-sets and emotions, « Goodbye Blue Sky » wishes to provoke the viewer’s release into a pensive state, pitched into one’s own blues and lost paradises.